HomeFrom the Officersbring your lady or a friend and join us in making life long memories. 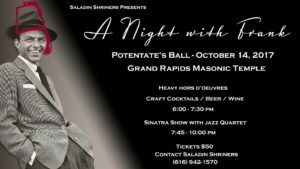 Tickets for the 2017 Potentates Ball are on sale now! Tickets are $50 each or two for $100. New Shriners and seasoned Shriners don’t miss this opportunity for great fellowship. We expect this to be the best Potentates Ball in a decade- bring your lady or a friend and join us in making life long memories.